Bubba the Pirate: Swab the deck, oil the teak! Swab the deck, oil the teak! Today was a bit of a lay day. Just as I was rolling in to the marina, a good friend called and came by to see the boat and visit. It was pretty hot, so we ran into Douglas to the Respite Coffee shop for an iced Americano. Earlier in the week, another friend stopped by the boat. Sometimes it takes giving a tour to notice the obvious. I hadn't oiled my teak in about 18 months. So, I broke out the tung oil and mineral spirits and went about it today. 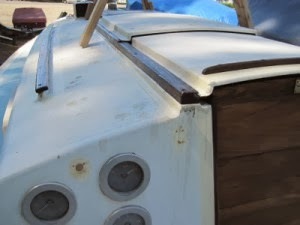 It was almost like having a real boat instead of a project. I was making her prettier instead of building or tearing down. A nice relaxing day, but a necessary accomplishment as well.